Tampa, Florida-based Checkers Drive-In Restaurants are disappearing from intown neighborhoods and thus far being replaced by nothing. As many of you know, Checker's pad sites are often small as few feature any inside dining. Most Checkers feature a (twin) drive-thru and a walk up counter. I say twin drive-thru, but in my earlier years I 'd dine at Checkers with some frequency and the twin seemed like a joke, as basically never were both lanes open. This is not a normal post for me, but I noticed a number of them close lately, and thought I'd share my thoughts. Locations on Peachtree (Industrial) Boulevard in Chamblee, Buford Highway in Chamblee and North Druid Hills at Lawrenceville Highway in (greater) Decatur have all closed over the past two years and more closures may be on the way. I spoke with a representative from Checkers corporate office in 2009 and was told then that they see their opportunity for growth with "in-line" locations, and would be prioritizing their expansion of that model ahead of free-standing units or "FSUs." 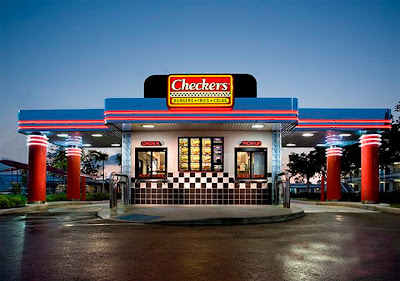 In 2009, Checkers opened a restaurant in Lenox Square's food court and later opened an in-line location on Broad Street, near Georgia State University. Shortly after this opening in late 2009, another Checkers opened in Peachtree Center's food court and another replaced what had previously been a McDonald's in the food court at the Mall of Georgia. I often myself wonder what would make an ideal tenant in a given location. The Buford Highway location for instance, is at a major intersection, Buford Highway at Clairmont Road. This site is decently sized but not nearly enough for a typical FSU of most eateries. Additionally, years ago, an adjacent street was sealed off, limited access to the restaurant. Also, across the street sits a far more appealing out-parcel in the recently vacated El Pollo Loco restaurant. EPL's Chamblee location was built in 2008 and closed in September. The EPL features both a drive-thru and plenty of inside dining. The building is just over three years old, and while unique to the EPL brand, could surely be utilized for another concept or be retrofitted to fit the needs of another concept. The location at Lawrenceville-Highway and North Druid Hills is probably the most appealing of the locations. It's by far the largest, and has access from both Lawrenceville Hwy and North Druid Hills. In addition, the parcel is a stone's throw from Highway 78. It's located adjacent to a drive-thru only Chick-fil-A and a McDonald's. I see this location as ideal for an expanding fast food chain, although given its proximity to Chick-fil-A, Zaxby's is unlikely. The site sits in front of North DeKalb Mall, an aging mall that has lost nearly all of its national retailers and restaurants. One of Chick-fil-A's earliest mall expansions was within this mall, but even it closed over a year ago. A Costco has long been rumored to open either as part of, or in some way connected to the mall, but that plan seems permanently shelved at this point. Costco has said in the past that their new TOWN Brookhaven store is a replacement for what they had hoped to open at North Dekalb. The location on Peachtree Boulevard has been vacant the longest, over a year if I were to guess. It's one of the most unappealing spaces from what I can see. It's parcel is not completely level and would likely need to be graded and leveled for any future use. It is located across the street from Chamblee Plaza, an aging and largely vacant shopping center. On the plus side, just north of Checkers site on the same side of the road, McDonald's operates a renovated restaurant and within Chamblee Plaza, IHOP opened last month in a former Hardee's restaurant. Also, Chick-fil-A renovated their existing outparcel space in Chamblee Plaza this past February. Now that I've weighed in, what are your thoughts? Do you think this is the right move for Checkers? Do you have an idea for what should open at one of their vacant stores? The Broad Street (GSU) location has been closed for a couple of weeks. Growing up in South Florida, Checkers was a unique place we'd stop through for hot dogs after soccer or baseball practice. I'm sure I'm not the only one who preferred hot dogs to cheeseburgers at that age. Plus their fries were like the ones at a baseball stadium which all the kids love. I think Checkers would have been best served marketing strongly to kids so they asked their parents to take them there. I'm not sure any kids these days are saying "Mommy please take us to Checkers." I'm sure renting/buying land and building the FSU's is very expensive compared to opening in-line space. Perhaps in the long run the brand will last longer with their current less expensive strategy. The Broad Street Checkers has closed. Good riddance. They are eyesores. Their stores are the gaudiest of the ugly bunch. Zaxby's stores are at least somewhat attractive and try to blend in with the neighborhood. I hope Checker's closes the 14th street location. Can you imagine overpaying to live at Aqua condos and have to look out at that overgrown pinball machine? Not to mention that one of the Checkers customers walked across the street to rob and murder an Aqua resident. Guess my time away from GSU is catching up to me. Amazing that location didn't last longer with the student traffic. I recall the tragic murder of Mrs. Calle but I don't think the perpetrator was a Checkers employee. I recall reading he dined their prior to committing the murder, but nowhere that he was an employee of the restaurant. I'd hate to spread a rumor like that but if you know otherwise, please share. No, he wasn't an employee he was a customer. Maybe the spicy chicken sandwich drove him into a fit of rage or maybe it was the terrible and slow service that set him off. Surprisingly, I think that a drive-thru only Starbucks could do decent business in one of these, maybe the one near N. Dekalb Mall. Starbucks isn't doing this currently, and maybe they think it would 'cheapen' the brand. All I know is that when I drive by the Starbucks way out in the sticks (Berkely Lake area), there are a lot of cars going through the drivethru. Drive thru only Starbucks would be great. I drive out of my way to go to a Starbucks with a drive thru. Anyway about Checkers....I go past several of them but never stop. I think it is because of the design of them....I think they look awkward and I have the impression their food isn't very good. I think part of Checker's problem was keeping the Rally's name around for a long time. I don't work to far from the former N DeKalb Mall location and it was tough to get in or out of depending on which lane of traffic you're in or trying to get to. So a busy intersection can be a blessing or a curse. I've always been a fan of Checker's fries. Especially when you could get them loaded with cheese and bacon. The N. Druid and L'ville Hwy location has access IF you are southbound on L'ville Hwy or eastbound on N. Druid Hills. Traffic stopping at the light on N. Druid blocks any realistic access coming west on that road, and a median at L'ville Hwy blocks access if you're headed north on that road. I live in the area and routinely see cars having a tough time getting in and out of the neighboring parcels in this strip. There is currently a Checkers restaurant for sale in Bremen, Georgia. They really need to reopen the one in chamblee ga. It drives me crazy how long its been sitting there abandoned and it was my favorite.